No one can argue with the fact that American cookies are the best. When I lived in Paris and came to the US, I kept bringing a ton of American cookies home to my friends and relatives. My childhood friend Alexia, who came to visit us this month, came home with 8 dozen of American cookies to gift to her relatives! Cookies are always a nice treat no matter the age of the cookie monster or the occasion being celebrated. Several years, I came up with this new recipe for homemade cookies with an exotic twist (pandan extract) for a change and they've become my signature cookies for special occasions. 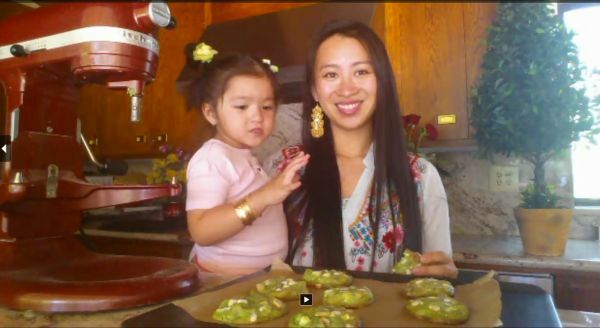 Follow the instructions from this video and you'll have our family's favorite French-Asian fusion cookies. Check out my other video cooking tutorials and more. Xôi lá dứa is a very popular snack/dessert in Vietnam. 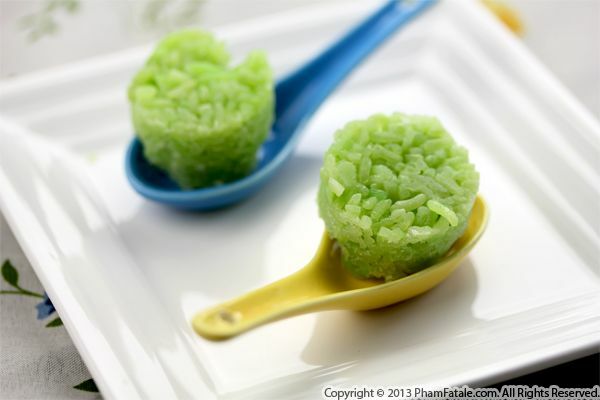 It's made of pandan-flavored steamed sticky rice covered in sweetened, fragrant coconut milk. Sticky rice can be flavored in many ways and there are plenty of savory versions as well, but our favorite is the one prepared with pandan leaves. 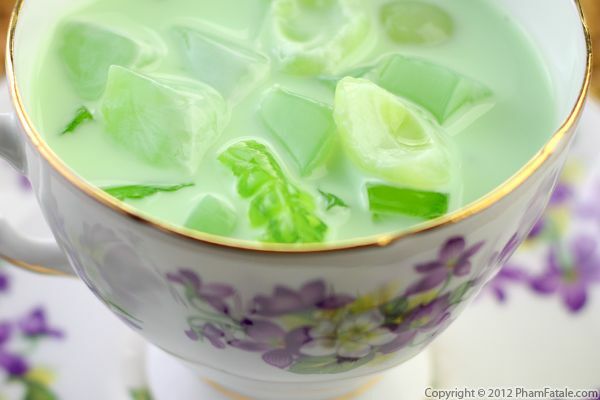 To save time and add extra flavor, I used store-bought pandan paste in addition to the pandan leaves and also added coconut powder and coconut milk. Don't be fooled by the vegan aspect of this festive dessert, I serve it in small portions because of its rich properties. The more authentic way of serving xôi lá dứa is to present it family-style on a large platter and to pair the sticky rice with freshly-grated coconut shreds and powdered, sweetened peanut and sesame garnish. It's Saint Patrick's day next week, so I thought I would feature our family's favorite snacks: sweets, of course! I prepared strawberry-flavored shortcake batter as the base of the dessert. To ensure a moist texture, I also added crème fraîche. For the green decorations, I used cream cheese frosting colored with pandan paste and light green sprinkles. My little one adored them and I enjoyed watching her eat them just as much. Give this recipe a try next Monday; these mini sweets would make a leprechaun "green" with envy. 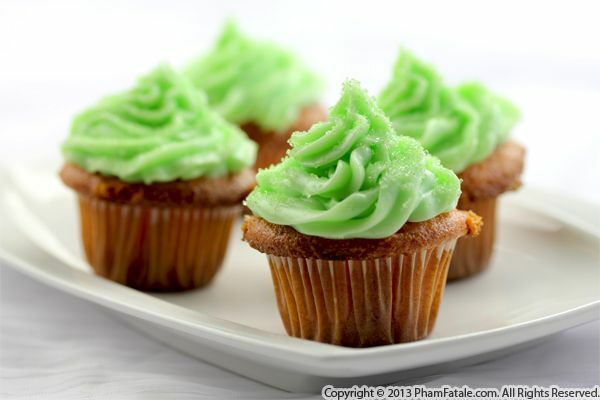 Is there a better ingredient than pandan paste to create a dessert symbolizing St. Patrick's Day? This evening, I used it to make "greenies". Instead of the semi-sweet or dark chocolate brownies traditionally call for, I used white chocolate and flavored the gooey dessert with pecans and a generous amount of pandan, which creates a beautiful green color. 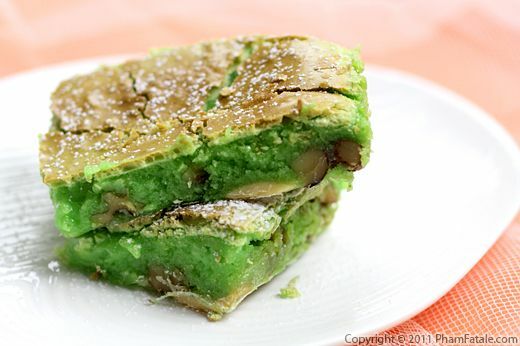 It’s a sweet treat that would make a leprechaun “green” with envy. Sorry, couldn’t resist. Happy St. Paddy’s Day everyone! Page 3 of 3 pages.